Sour cream and cream cheese put the marbleized deliciousness in these out-of-this-world scrumptious Marble Squares. Preheat oven to 375°F. Microwave butter, water and 2 oz. chocolate in large microwaveable bowl on HIGH 2 min. or until butter is melted; stir until chocolate is completely melted. Chop remaining 6 oz. chocolate; set aside. Stir in combined flour, 2 cups of the sugar, the baking soda and salt. Add 2 of the eggs and the sour cream; mix well. Pour into greased and floured 15x10x1-inch baking pan. Beat cream cheese and remaining 1/3 cup sugar in small bowl with electric mixer on medium speed until well blended. Add the remaining egg; mix well. 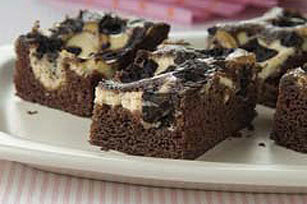 Spoon over chocolate batter; cut through batters with knife several times for marble effect. Sprinkle with the chopped chocolate. Bake 25 to 30 min. or until toothpick inserted in center comes out clean. Cool. Cut into 36 squares. Makes 3 doz. squares or 36 servings, 1 square each.